Pronation/Supination Elbow Component Left, Size: LProvides infinite, static progressive positioning of the forearm in pronation or supination.Orthotic shells are made of Kydex® for optimal force distribution, stability and durability. Can be modified slightly using a heat gun. Latex free. Ideal for managing contractures due to neurological disorders, muscle hypertonicity or orthopedic conditions affecting the forearm. Recommended for serial splinting to increase range of motion or for post-operative use to limit or prevent forearm rotation.A removable, neoprene liner is included with the elbow component. D-ring hook and loop straps provide easy application and cinching for a proper fit. Neoprene pads slip onto the straps, providing optimal comfort and support across the arm. Anterior arm design facilitates self-donning and doffing and lets the arm rest on a tabletop for greater functional use and comfortable positioning. Elbow is held static at approximately 60° flexion.Fits left or right arm. Some assembly required. Clean with soap and water. To size elbow component, measure biceps circumference. Large size weighs 1 lb., 12 ozs. (794g). Use under the supervision of a medical professional. Size:Elbow Component:Small: Biceps Circumference 8½ “ to 11“ (22 to 28cm)Medium: Biceps Circumference 11½ “ to 13½ “ (29 to 34cm)Large: Biceps Circumference 13½ “ to 16“ (34 to 41cm) Product photo may not exactly match the product offered for sale. Please refer to the product description. 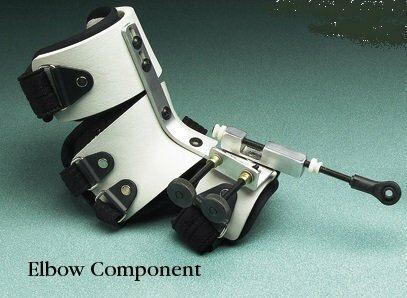 Provides infinite, static progressive positioning of the forearm in pronation or supination.